THIS AFTERNOON: Temperatures are only in the 40s over the northern third of Alabama this afternoon with a chilly north wind; Birmingham reported 53 degrees at 3 p.m. That is 13 degrees below the average high of 66. Tonight will be clear and cold, and freezing temperatures are likely over most of the state. 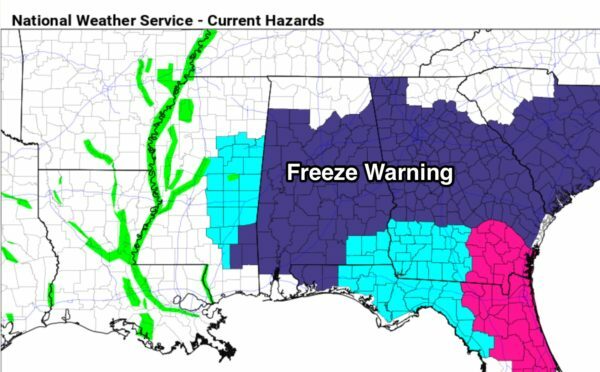 A freeze warning is in effect. Lows will range from 23 to 32 degrees for most communities across north central Alabama. Then, a warming trend begins tomorrow afternoon, as temperatures rise well into the 60s. FRIDAY AND THE WEEKEND: Clouds will increase Friday, and the latest model data suggests showers could move into the state as early as Friday afternoon. We will continue to mention a chance of showers and thunderstorms Friday night as a weakening front approaches. 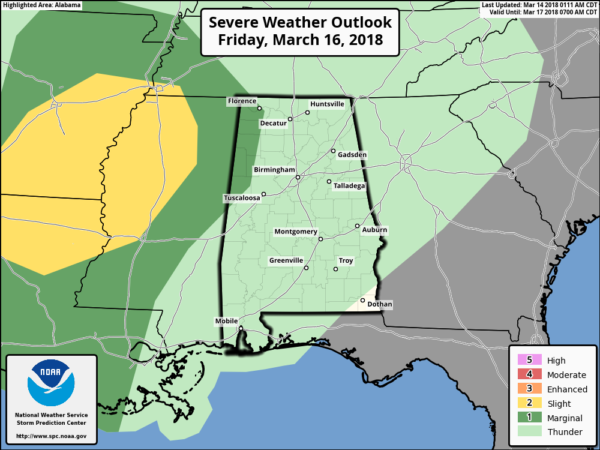 The Storm Prediction Center maintains a marginal risk of severe storms for the far northwest part of the state Friday night, but the main threat will be well to the west. The front will become stationary over central Alabama Saturday morning, and a decent part of the afternoon should be rain-free, especially from I-20 north (north of a line from Tuscaloosa to Birmingham to Anniston). Scattered showers are possible south of I-20, but nothing too widespread or heavy. And Saturday will be very mild, with a high in the mid 70s. Sunday the boundary will drift northward, and we will mention some risk of scattered showers during the day, but again the rain Sunday for now doesn’t look too extensive. 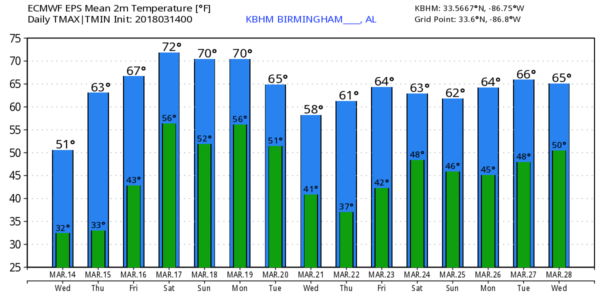 The Global Forecast System model is printing a high of 77 at Birmingham Sunday afternoon. SUNDAY NIGHT/MONDAY: A deep surface low is forecast to develop northwest of Alabama, and we will mention a chance of showers and storms Sunday night into Monday. There will be some surface-based instability with potential for strong storms, and we will monitor parameters for severe potential in coming days. Monday’s temperatures will remain mild, with a high between 72 and 75. REST OF NEXT WEEK: Another upper trough forms over the eastern U.S., and another nor’easter develops off the Atlantic coast. This will pull down more cold air during midweek, and we could be dealing with potential for another late-season freeze Wednesday and possibly Thursday morning. WEATHER BRAINS: You can listen to our weekly 90-minute netcast any time on the web or on iTunes. This is the show all about weather featuring many familiar voices, including meteorologists at ABC 33/40.